Description: The Pewabic ran from Cleveland to Lake Superior ports. 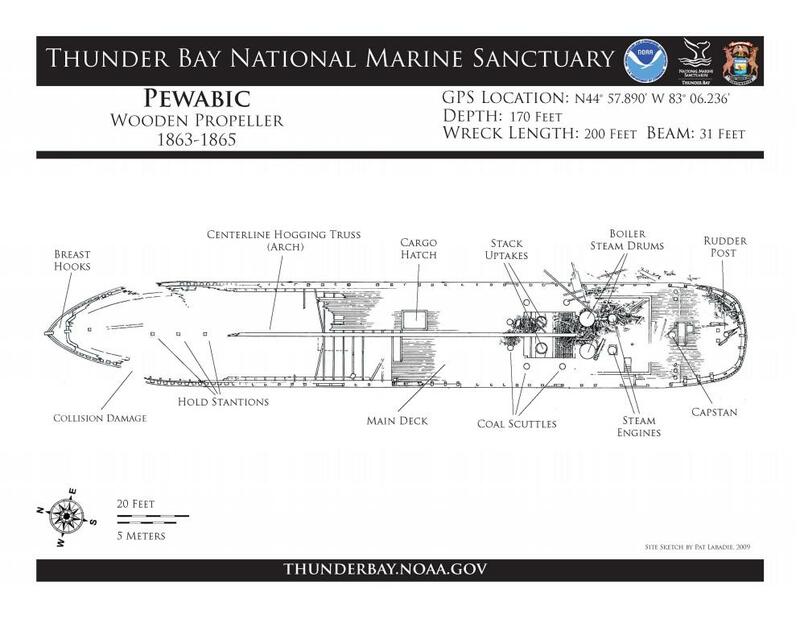 It was two years old when it sank off Thunder Bay in a collision with the steamer Meteor. Steaming southward, it headed close enough to the Meteor to pass mail and news between the two ships, but the Pewabic unexplainably cut across the Meteor's bow making a collision unavoidable. The ship suffered a large hole in the port bow and sank within minutes taking at least 33 passengers and crewmen. Several attempts were later made to retrieve the valuable copper cargo, using diving bells, clamshells and dynamite. They left the hull intact, but all of the cabins were destroyed. Photomosaic showing arch and salvage damage at bow.